Finally, the killer is revealed, and I can discuss it. Also, goodbye Harold, and I won't discuss you. The question the show leaves us with is how complicit Leland is in his daughter's murder. The show suggests he's a blank slate, too weak and morally corrupt to defend against Bob, or even be aware of him. The movie suggests otherwise -- that Leland was the prime actor, and Bob was mostly along for the ride. It's interesting to rewatch the series aware of Leland's guilt, because there are moments when the show clearly indicates it was him (in one instance, while people are discussing the murderer, the camera cuts away to Leland dancing.) Lynch reportedly told a horrified Ray Wise "It was you, it was always you" when breaking the news to him, and you can tell that it actually was always him. There are some hints that Leland was also aware -- the biggest is that he immediately knows when Truman comes to break the news to him about Laura. Truman never actually says anything to him, and it's Laura, so there are a million things he might be coming about. I mean, she was a prostitute, she used and helped sell drugs, she claims Bobby killed a man, she was never home, and, who knows, she could simply have broken her leg. But Leland immediately declares "My daughter is dead!" Nobody needs to tell him Laura is dead. He knows it. I'll discuss the more explicit elements of Leland's murderousness when we get to the movie, but I'm glad that's out in the open now, so we can talk about it. Also, the murder of Maddy is really heartbreaking. It goes on forever -- four minutes -- and it was the first indication that Sheryl Lee was capable of communicating something that she would use extensively as Laura in the movie: She can at once look horrified, terrified, and heartbroken. Her murder is one of the saddest things the show produced, and it is agonizing to watch it. Oh, there's also the appearance of the white horse as Sarah Palmer drifts off to sleep. That horse appeared to her once earlier, on the night of Laura's murder, as we will find out in the movie. I suspect she knows it means death (death comes riding a pale horse), which is why she's in such a panic at the start of the show when Laura doesn't come home. I mean, Laura snuck out all the time. You get the sense that she was never home at all -- and who can blame her? But this one morning, after seeing the horse, Sarah knows something has gone wrong, and starts making desperate calls to track down her daughter. I was also quite pleased to see the second appearance of the tall, elderly waiter at the Roadhouse coincided with the reappearance of the Giant, lending credence to my theory that the waiter is in fact the Giant's host body. Did anyone else notice what Maddie said when Leland was revealed as BOB? I don't have the exact quote, but she said that it "smelled like something was burning." On previous watches, I think I either shrugged it off, or assumed that something had been left on an unseen stove as part of the general disarray of the house, but now it's clear to me that it must be the same burnt-oil smell that Jacoby recalled from Jacques' murder. It's nice when a detail like that snaps into place. Okay, I did a little more reading in the TP wikiverse, and discovered that my Giant/waiter theory is pretty much commonly-accepted knowledge among Peaks watchers at this point. It's reassuring to know that I'm on the same page with everyone, at least. Like maxsparber, I'm also a bit unclear on the exact Leland-to-BOB ratio that we've had over the course of the series so far. The Secret Diary of Laura Palmer dances around the issue of BOB's true identity by presenting him mostly as a voice inside Laura's head, with a few notable physical manifestations. Of course, Laura's slide into drug abuse and unhealthy sexual behaviors isn't directly explained, but there is the sense that we're not getting the complete story, and childhood abuse seems like a likely unspoken cause. Early in the book, we can see that 12-year-old Laura's being groomed for sexual purposes by Ben Horne, which appears to point (like the show does for a time) to Ben being BOB. Interestingly, the book paints Leland as a something of a cipher. He appears in a couple of Laura's disturbing dreams, but other than that he's weirdly absent. Given just the revelations of this episode and FWWM, it seems like the reader might be able to treat BOB and Leland as one and the same for the duration. But going by the series as a whole, BOB and Leland's level of overall integration seems a lot more ambiguous. Maybe there aren't any straight answers, and it's left to us to decide who's more responsible, the demon or the man. This is the nadir (or near it) of several of the b-plots in S2... Nadine in high school, obviously... Shelly and Bobby at home... a lot of this stuff seems like fan service towards Twin Peaks being weird that ultimately misses the point. Even though I'd probably lump the Catherine reveal into this, I can't help but love the scene with Pete. I credit Piper Laurie and Jack Nance's acting chops. On the other side of that, the fakeout with Ben Horne is pretty great. I wish I could come into this fresh (I watched FWWM first! ), but I have to wonder how much I would've bit on Ben and not gotten the Leland switch-a-roo until he kills Maddy. The Sara scene is horrific, as is most stuff involving BOB. The way that the Palmer house is shot and presented is just incredible. Everything seems normal, but that first shot of Sara climbing down the stairs with the eerie sound of the skipping record player (echoing the later IT IS HAPPENING AGAIN scene), the ominous ceiling fan... culminating in the ominous reappearance of the white horse and Leland, totally composed, adjusting his tie in the mirror. The Log Lady reappears, and brings in the good Twin Peaks weirdness (frightening, unsettling, dreamlike). We get the beautiful music of Julie Cruz and Angelo Badalamenti to score many of our primary characters meeting up at the central location of the Road House (God, I want a dive biker bar with live doo-wop). Finally, with a full version of the show's theme, Cooper has his climactic vision, indicating that he was too late to stop BOB from killing again. Then a cut back to the record at the end of its groove, and the mirror shot that reveals the central mystery of the show. Amazing, really. I wish I could've been there to experience that live. Leland puts on his gloves, and probably the most horrifying scene of the series occurs. Poor Maddy. I do wonder what would have been the plan for Sheryl Lee had they gone to a third season. Does this symbolize Leland taking control long enough to kill her before BOB could do something even more twisted with her? Or is it BOB making sure that he gets his kill before Leland can stop him? Are the letters Leland's way of shouting through his madness to try and lead Dale to him? Or is it BOB's way of laughing in the face of law and order (which is to say, the White Lodge)? Regardless, Maddy is dead, and Cooper has failed. The waiter says he's "so sorry," and James, Bobby and Donna all seem to know already that something else horrible has happened. Fade into the red drapes of the Road House, but without a doubt the red drape of the Black Lodge, too. Interestingly the credits roll over Coop's face and the drapes superimposed on one another... giving a sinister hint towards what will happen later in the series. This was one of the most tense, scary episodes of this show. So difficult to watch. This episode marks the point at which it's all new to me - the first time I watched back in 2003-4, I stopped watching Season 2 right here. 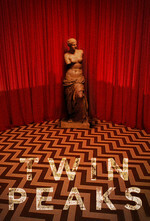 And holy hell, what a place for Twin Peaks to once again be "new" for me. I knew the reveal was coming, but I wasn't expecting it to be so masterful, horrifying, heartbreaking. I also watched this episode after indulging in some substances to, er, enhance things, and right at the part where codacorolla mentioned - "that first shot of Sara climbing down the stairs with the eerie sound of the skipping record player " - I felt such a shiver of bad emotions. Everything from there to the end of the episode is Lynch at his best. I was shaken. Also the elderly waiter saying "I'm so sorry" to Cooper was oddly affecting. Was that just me? Strange Interlude: "... the same burnt-oil smell that Jacoby recalled from Jacques' murder. It's nice when a detail like that snaps into place." It's worth noting that Jacoby did not remember the burning smell from Jacques' murder. In the episode where he first mentioned it, Truman just asked Jacoby if he remembered anything (not being specific about what he meant) and Jacoby said he remembered the smell of burnt motor oil. But when they hypnotized Jacoby in the next episode and prompt him about the burnt motor oil, he said specifically that he remembers that smell from the park earlier, where he got hit on the head. This seems important, if only because (at least by show logic, if not movie logic) it was Leland who killed Jacques - not BOB. But it was BOB who hit Jacoby on the back of the head. I'm still not entirely sure why, but that seems to be the way of it. Also, I'm fairly certain this is the best episode of the series, and thereby one of the greatest television episodes ever made. Without it season two could have died immediately - there were already so many sort of off-kilter story lines and misbegotten characters (Catherine's yellowface chief among them, followed by Harold's nuttery) but Lynch not only resolves all of the , he revitalizes them. Every moment is sad, suspenseful, warm, and terrifying all at once. There was a hint in the previous episode about the Japanese businessman not being what he seemed. When they were in the lounge at the Great Northern watching Leland sing, Pete leans over and says "The King & I? ", a show known for having a white actor play an Asian character. So I've been re-watching the series to prepare for the new shows. First time all the way through since it originally aired. Last night I thought "oh hey, I've got another hour before bedtime, let's watch the next Twin Peaks." I didn't realize that the next episode was THIS episode. THAT episode. Where we find out who really killed Laura by seeing him strike again. I think this is still one of the most nightmarish things ever shown on television - in the literal sense of nightmarish, as in a frightening dream you're stuck in and can't escape. The ticking of the record player. The shifts in lighting. The slow motion. The sound distortion of the screams, moving in and out. The flickering back and forth of Leland and Bob. "There are owls in the roadhouse." "It is happening again." "I'm so sorry." People in the roadhouse breaking down in tears for no apparent reason. Not what I needed to see right before going to bed, but quite a testament to what an amazing piece of work it is that it's still so damn shocking and horrifying, all these years later.